Jarratt’s Hotel, often misspelled Jarrett’s, was a prominent landmark in antebellum Petersburg, Virginia. 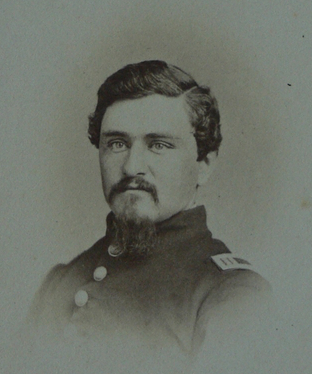 James Henry Platt, Jr. was assigned command of Company B, 4th Vermont Infantry early in the war, but was soon detailed as acting assistant quartermaster at VI Corps headquarters. As temporary acting chief, Platt was captured on May 30, 1864, while seeing to the transfer of supply toward Cold Harbor. Aided by the personal appeal of Maj. Gen. Horatio G. Wright, commanding the corps, Platt was exchanged in October. He mustered out of the army the next month and was not alongside his former comrades in the Vermont Brigade when they broke through the Confederate lines southwest of Petersburg on April 2, 1865. Nevertheless he was likely retained in some military capacity around Petersburg, official or otherwise–a biographical sketch stated that he settled in the city just four days after the Breakthrough. 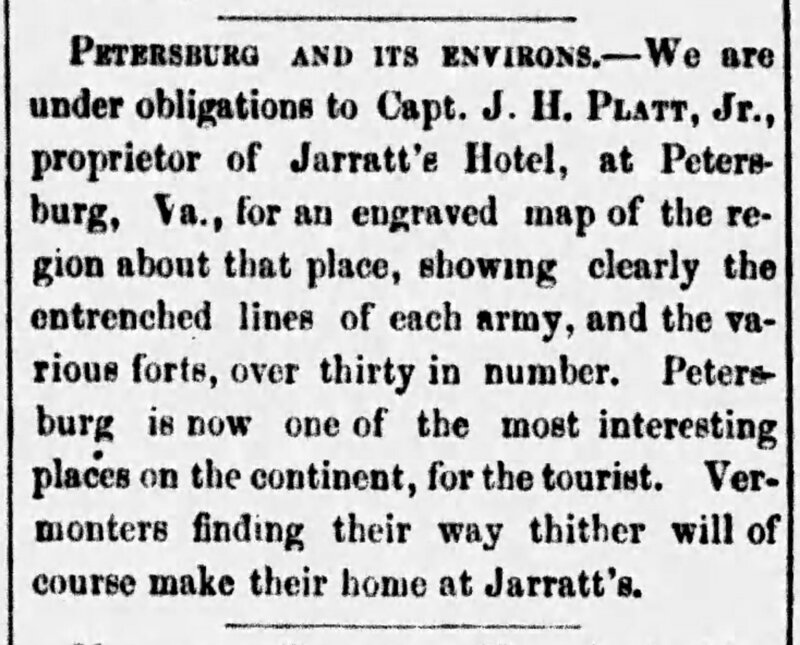 Platt latched onto the presumably vacant Jarratt’s Hotel immediately and helped generate early interest in Petersburg as a tourist destination. The next year he published A Guide to the Fortifications and Battlefields around Petersburg exclusively for hotel guests. This groundbreaking 1866 document can be viewed here – https://archive.org/details/guidetofortifica00jarr. It is definitely one of the earliest Civil War battlefield tourism publication of its kind. I’d be happy to hear in the comments of anything that predates it. Vermont newspapers touted Platt’s pamphlet. The extract below from the May 29, 1866 Burlington Free Press referencing the publication’s included map and promoting the hotel to travelers from the Green Mountain State. Those in Dixie would probably call Platt a carpetbagger and his early engagement in the postwar south paid off for his career, gaining a seat on the Petersburg city council and representing the Cockade City in the 1868 Virginia Constitutional Convention. Two years later, after moving to Norfolk, Platt was elected to the United States Congress as representative of Virginia’s 2nd congressional district. He served for three terms before moving to New York and ultimately to Colorado, where he died in 1894. His story is one certainly worth taking a deeper dive into, but I just happened to glance at the Rutland Weekly Herald article shown at the top of the page while scanning for material for another project. I would love to one day find proof that some of Platt’s comrades swung by the hotel during their travels and perhaps used his early battlefield guide to trace their wartime movements. This entry was posted in Battlefields & Historic Places, Newspapers and tagged battlefield guides, James Henry Platt Jr., Jarratt's Hotel, Petersburg, Tourism, Vermont Brigade. Bookmark the permalink. Ha! What a lucky find and what a great story. Thanks for sharing… I hope your appeal for evidence of Green Mt. tourists at Jarrat’s Hotel yields results. I’ve had experiences reading through digitized 19th Century newspapers on the LOC website, finding an article or advertisement unrelated to my original research but interesting enough to lead to a whole new avenue of inquiry. But I have yet to encounter anything nearly as novel or interesting as your lucky discovery! Thank you for sharing this interesting story. Sometimes the most interesting things hide in the most obscure places. The rise of battlefield tourism post-Civil War sounds like a wonderful topic for study.